Giblet Gravy Recipe – Texas Style. Make this Southern-Style Gravy for your next holiday. This Recipe for Giblet Gravy is made better by only one thing, and that is our Southern Cornbread Dressing Recipe. My late mom’s family recipe for turkey dressing includes giblets from the bird and as a kid I it was added flavor that I never could fully appreciate. Oh, how things can change over the years, including palates and taste preferences. This Giblet Gravy is a perfect example of what I’m talking about. 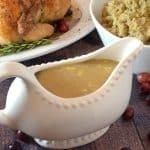 I wish my mom have tried this special gravy on her turkey, dressing, and mashed potatoes! This old-fashioned giblet gravy tastes great with both chicken and turkey. When making gravy, it all starts with a roux! 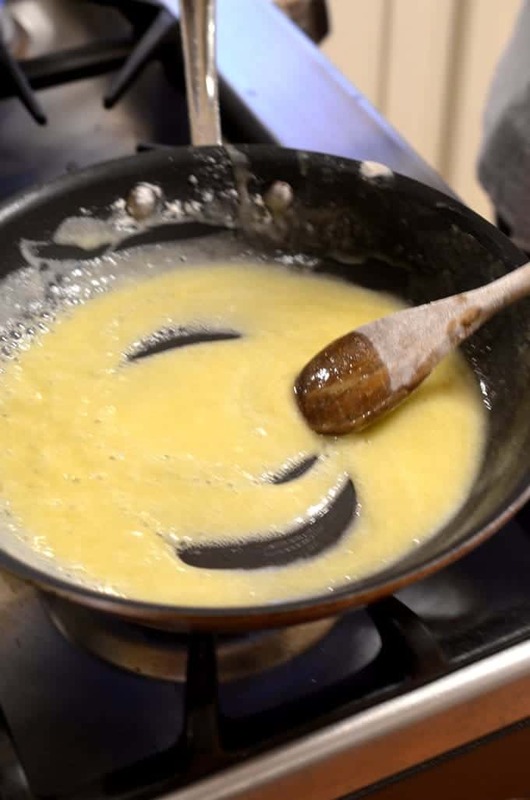 Start to cook your roux with approximately equal parts butter (or other fat) and flour. A roux is in an essential part of any homemade gravy or sauce and many soups and stews. You need a good roux, anytime you plan on making gravy. Chef Kat from Platter Talk hosts a very informative primer on creating a proper roux on her favorite post, How Do You Make a Roux? Finely dice the giblets because they can have a pretty strong taste if not chopped small enough! 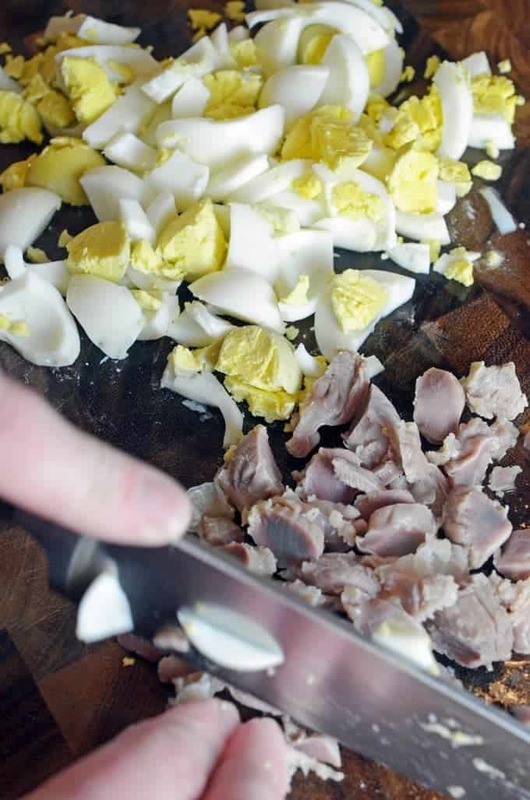 Chopped giblets and hard-boiled eggs are a big part of this classic southern recipe for giblet gravy. Some people call this turkey neck gravy, but you’re going to use all of those little pieces that are found in the separate bag that’s inside the cavity of your bird. Aside from the giblets that are found in this recipe for Homemade Gravy, there is another ingredient that you may find surprising: sliced bits of hard-boiled egg. Not everyone knows how to cook hard-boiled eggs but once again, Chef Kat shows you how in the previous link. This may sound unusual to some of you but try not to judge, until you taste this classic southern recipe. The eggs will grow on you, and by the end of the meal, you’re going to wish you had tried gravy sooner. This, I promise. 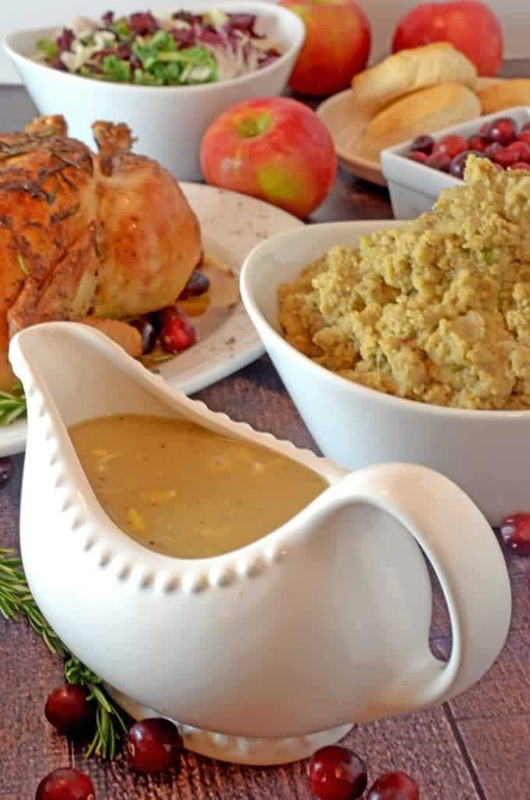 This Giblet Gravy is terrific for either your favorite chicken recipe or turkey recipe. Just use chicken giblets or turkey giblets, depending on what you are making. If you’re looking for the perfect dressing to douse with this flavorful and savory gravy, look no further. Instead, try our Southern Cornbread Dressing Recipe, and your life will never be the same. This, I promise. 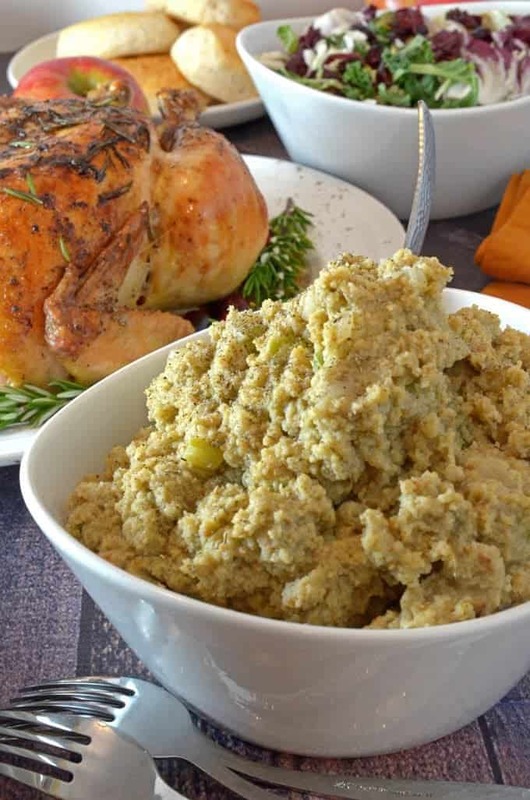 This easy-to-make Southern Cornbread Dressing Recipe is the perfect mate for our Giblet Gravy. My Texas friends put this meal together for me, a few weeks ago while Scott was out of town. Watching them prepare this Giblet Gravy was only part of the fun. The real joy, as is the case with any good meal that is shared between family and friends, was the conversation and communion within and listening, absorbing and savoring the familiar banter that centered around the featured foods which were true, timeless and perfected family recipes. Memories of childhood, the revered Granny Spence and many stories of the family all dotted the conversation. This food is the essence of family and the very heart of Thanksgiving. Make turkey giblet using this recipe. Giblets add great flavor to homemade gravy! Read about this southern-style gravy and learn how to make Giblet Gravy for your next holiday. 1 handful giblets boiled and chopped. Using large sauce pan, bring broth and seasoning to a boil. Take part of liquid and ladle into the roux, whisk together and then add to main broth. Keep whisking at a slow boil until it thickens. This looks just like the recipe my grandma made many years ago. Have you ever made this 2 days ahead and reheated? The recipe looks fantastic! You can most definitely make this southern cornbread dressing ahead of time! Thanks for the lovely comments and question! This sounds scrumptious and I’m getting ready to throw it together for the first time, can’t wait. i just finished making this! Because I knew I would be pressed for time, I prepared the giblets and eggs yesterday. I’ve had giblet gravy before, but I’ve never made it! This recipe will be a new Thanksgiving tradition! Thank you so much! Sherry, so great to hear! Thanks for the nice comments and we are happy that you enjoyed this. recipe! Reading this recipe reminds me of what my mother made in the 50’s. Going to givve it a try. 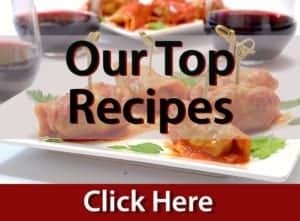 Is there a way to print the recipe? 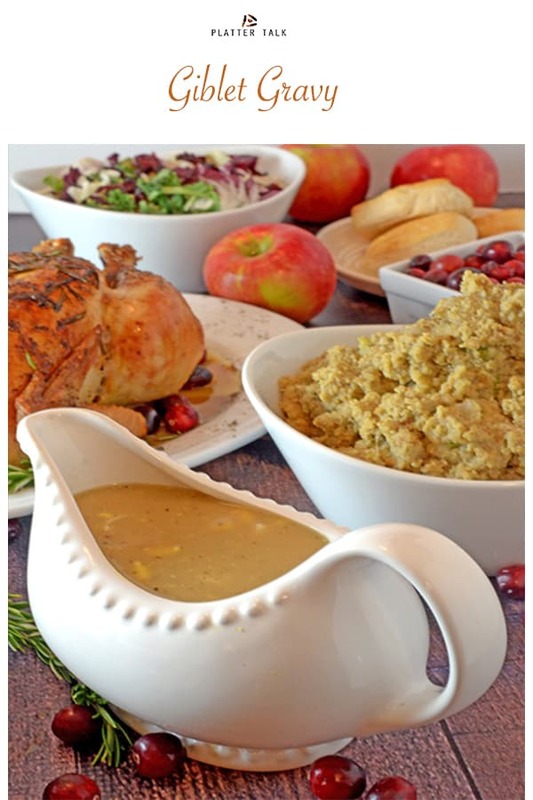 We hope you give this giblet gravy a try! To print the recipe, look for the “print” icon in the upper right-hand corner of the blue recipe card. It is located beneath the small photo on the top right corner. Thanks for the wonderful comment! I found it. Must have been trying too hard. Can I make this the evening before and refrigerate overnight, then heat up? Yes, that should be just fine. I thought a roux was usually equal parts flour and butter. So 3/4 cup butter then 3/4 cup flour. Or is it different in this recipe? I’m about to make it for the first time. Thank you! Kelly, traditionally a roux is made of equal parts of a fat and flour. In this family recipe, it calls for 3 heaping tablespoons of flour to approximately 3/4 cup of butter. If you would like for the gravy to be a bit thicker, then you can add additional flour to compensate. 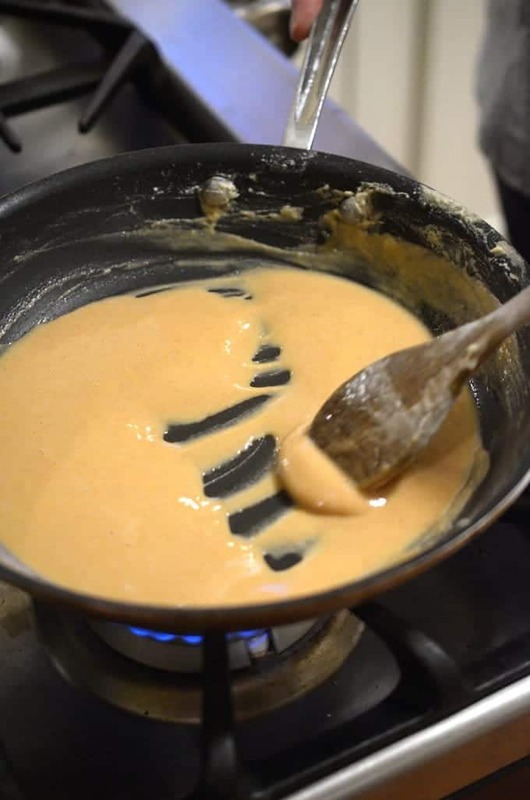 However, because this gravy also incorporates hard boiled eggs and giblets, it is not as thick as a plain gravy, Consider taking a look at our site on how to make a roux. 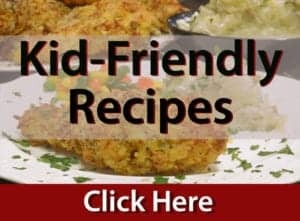 There is a link attached on the recipe page of this gravy. Thanks for your question. Happy Thanksgiving. Oops! I forgot to give you your stars… You deserve every single one of them!! Thanks for the great feedback, Maria! 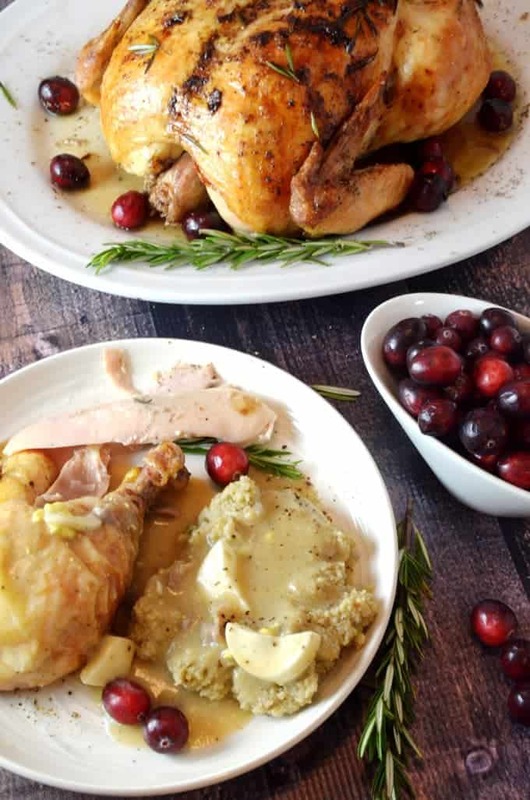 We are happy that you like this giblet gravy recipe! I made this tonight and it was fantastic!! What I couldn’t put in the container to save for Thanksgiving, I put it over toast and gobbled it up! Best snack ever! Would have never thought to add hard boiled eggs. but it does seem like a very Southern thing to do! 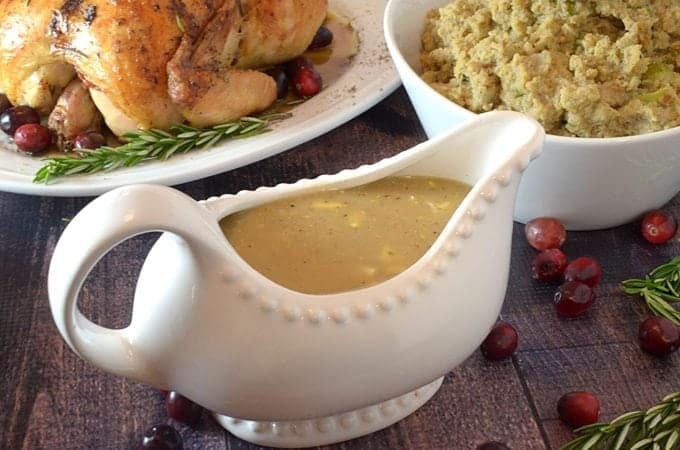 I’m all about gravy at Thanksgiving so I’m sure I’d enjoy this version too! Love the full Thanksgiving table photos. This looks perfect for Thanksgiving! Looks perfect!! A must make for the holidays! Giblet gravy sounds so good! I haven’t made it in so long though! Thanks for this recipe! I’m going to save it to try it out! Can’t wait to make it! Thanks for the positive comments, Tammy. A lot of people are unfamiliar with mixing hardboiled eggs with gravy and their outright rudeness is sometimes very surprising. This recipe for giblet gravy was new to me, and I have to admit that I had never heard of this concept myself. With that in mind, it did exactly what you said; it tied the entire meal together. Thanks again for the kind comments!. There is nothing better than a good gravy especially if it is giblet. There are some people who just toss those great giblets away — they don’t know what they’re missing. Your gravy looks perfect. Rich, creamy and full of flavor. YUM!! Oh how I love gravy but I usually keep it simple. Mom used to use giblets I tend to shy away from them. I must try bringing some next time. Sounds yum. I’ve never had anything like this before. My mom never included them so I grew up with pretty basic stuffing and gravy. I bet it adds so much flavor though! The best parts of the holiday meal are the GRAVY and the STUFFING. This recipe sounds delicious, and I know it would be a hit at our dinner table. Wow and Wow! The recipe for this gravy really impresses me! This is absolutely fantastic! So YUMMY! Is good food and this looks like one of the BEST!